Rose is a dancer and passionate about her art, but she's lost her way. A bad friendship leaves her disillusioned and unsure, and she tends to rush her way through school, avoiding others. Yrena is Rose's neighbor, a girl from the Soviet Union trapped in another country, but unable to see any of it. She too is a dancer, but she wants nothing more to do with it, only to be a regular teenager in one of the greatest cities in the world. When Yrena runs away and finds herself with Rose, the two spontaneously take off and have the night of a lifetime. Rose Sees Red is a funny, yet serious, tale that captures the tension that existed between two countries, and the instant friendship and ease between two very different girls. Rose and Yrena are so very different--Rose is "black inside", and Yrena is overflowing with love and zest for life, yet the connection between the two is instantaneous and unbreakable. 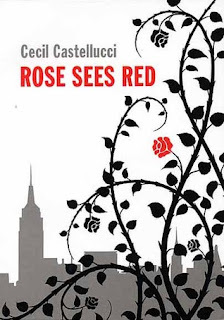 Yrena awakens something in Rose that can't be stamped out, and along with new friends Callisto, Caitlin, Caleb, and Maurice, they experience a night in New York City unlike any other, one that transcends political differences and changes them forever. They become friends and see past nationalities to the people they really are beneath. The revelation, though simple, is powerful and beautiful. Castellucci has created a captivating and surreal book about the power of love and friendship--you won't want to miss it. Cover Comments: I like that graphics on the cover a lot! Usually I get bored with the same black, red, and white color scheme, but it's done really well here! Rose Sees Red is available now! I'm crazy about the cover and I think the book will be awesome, I can't wait to read it.